Phase II of the Hamburg Hall renovation project has earned a LEED (Leadership in Energy and Environmental Design) Gold Certification from the U.S. Green Building Council for its use of sustainable and energy-efficient materials and systems. 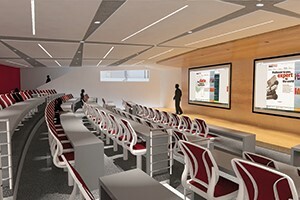 Phase II featured a new 150-seat auditorium-style classroom in the former parking lot between Smith and Hamburg halls and the transformation of Hamburg Hall 1000 into a grand entrance and lobby. 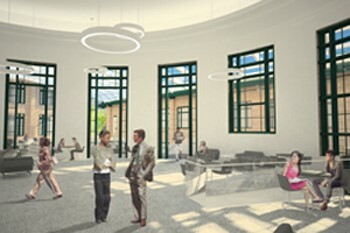 The lobby connects to the new classroom that is modeled after Rashid Auditorium in the Hillman Center. 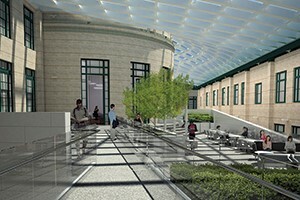 Phase II also included construction of an ADA-compliant entrance to Hamburg Hall from Forbes Avenue and an upgrade of existing infrastructure to meet current building codes. The U.S. Green Building Council awards LEED status in four levels — platinum, gold, silver and certified — based on the number of points a project earns across several areas addressing sustainability issues.